Featured amenities include dry cleaning/laundry services, a 24-hour front desk, and laundry facilities. A roundtrip airport shuttle is complimentary during limited hours. 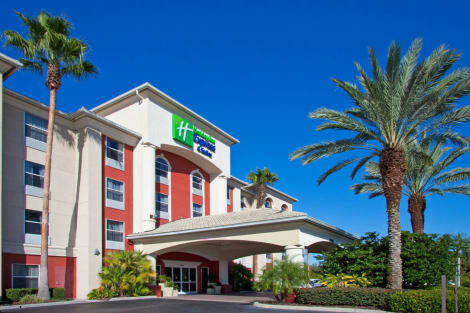 Guests staying at the newly renovated Holiday Inn Express® Hotel & Suites Orlando International Airport save travel time with our convenient location, enjoy Orlando's newest guest rooms near Orlandos' top attractions. While in Orlando, the hotel's guests can meet Mickey and Minnie at Walt Disney World® Theme Parks and enjoy easy access to the nearby Orlando International Airport (MCO). Corporate travelers can use the Business Center, which boasts print and copy services, making it easy to complete paperwork on the road. The close proximity to Orlando International Airport means the hotel's amenities include free airport shuttle service for guests. 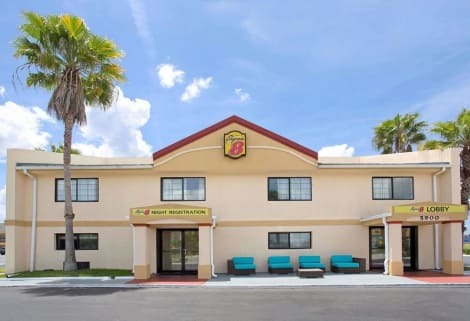 Thanks to our excellent location in Orlando, Florida, this hotel's guests find themselves just minutes from world-famous attractions like the magical Walt Disney World® Theme Parks and Universal Studios. Spend a few days at the parks, and then set aside the rest of your vacation to explore SeaWorld or take an afternoon to tour nearby Gatorland. After arriving via Orlando International Airport, the hotel's visitors can use the free shuttle that runs to the hotel. Each morning, enjoy the complimentary, hot Express Start Breakfast Bar, and plan your itinerary with the free high-speed, wireless Internet access. Book today, and we'll see you soon! Make yourself at home in one of the 121 guestrooms, featuring kitchens with full-sized refrigerators/freezers and stovetops. 32-inch flat-screen televisions with cable programming provide entertainment, while complimentary wireless Internet access keeps you connected. Conveniences include phones, as well as desks and separate sitting areas. Make yourself at home in one of the 135 air-conditioned rooms featuring refrigerators and microwaves. Flat-screen televisions with cable programming provide entertainment, while complimentary wireless Internet access keeps you connected. Private bathrooms with shower/tub combinations feature complimentary toiletries and hair dryers. Conveniences include desks and coffee/tea makers, and housekeeping is provided daily. Welcome to the newly renovated Holiday Inn Express & Suites Near Universal Orlando™ hotel As an official Universal Hotel Partner, we offer an unbeatable stay for your next Orlando vacation! Enjoy the convenience of being within walking distance to Universal Studios Florida™, Universal’s Islands of Adventure™ and Universal CityWalk™. Popular Orlando attractions like The Holy Land Experience, Walt Disney World® Resort, SeaWorld™ Orlando and Aquatica are also nearby. Just a few minutes off International Drive, explore the best shopping, restaurants and entertainment in Orlando. Orlando Premium Outlets and Mall at Millenia are all five minutes away and our 100% smoke free hotel is only 15 minutes from downtown Orlando. Every stay includes a free hot breakfast buffet daily, free Wi-Fi and use of our Business Center, Fitness Center, outdoor pool & 24/7 market. Purchase your park tickets from our onsite Universal Orlando kiosk Business travelers will also appreciate the location of our hotel just 10 minutes from Orlando Convention Center. Every room features a Keurig, spacious work desk, mini fridge, microwave and safe. Upgrade to a suite for additional space. Book a reservation today and enjoy great Universal Partner Hotel benefits and rates at our Holiday Inn Express & Suites hotel near Universal Orlando. Must be 21 years of age with valid credit card at check-in.